The Internet of Medical Things (IoMT) implements machine-to-machine interactions and real-time arbitration solutions that will radically change the delivery, affordability and reliability of medical devices in the near future. It is also healthcare compliance that increases patient participation in the decision-making process. 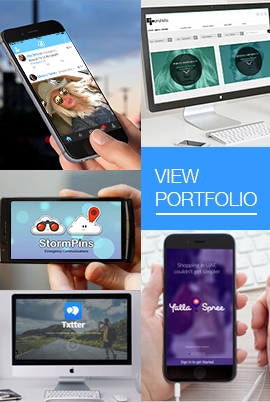 As a result, technology adoption is expected to touch $156 billion by 2020. IoMT promotes personalized care and a high standard of living by providing personalized data-based remedies and optimized devices based on physiological needs. In addition, recent research into the sensor, network, cloud computing, enterprise mobility and high-volume data areas will lead to inexpensive medical devices and inter-connected health ecosystems. This report covers in-depth expertise on the future aspects of IoMT technology. 1.2. Why Internet of Things? The Internet of Things ecosystem is a complex architecture that provides end users with a variety of solutions. It is an interdependent system that can control end-user applications through real-time data collection, device connectivity, data transfer and analysis. IoT provides a connected environment, including cyber-physical systems that integrate human intervention with computer-based systems and facilitate data-centric decision-making processes. Today, IoT has technologies like smart grids, smart houses, smart logistics and smart towns through sensors, actuators and communication protocol networks. IoT provides a variety of real-time solutions through data analysis and integration of sensors embedded in the system. Along with other industries such as manufacturing, goods distribution and construction, healthcare services are preparing for change via IoT. 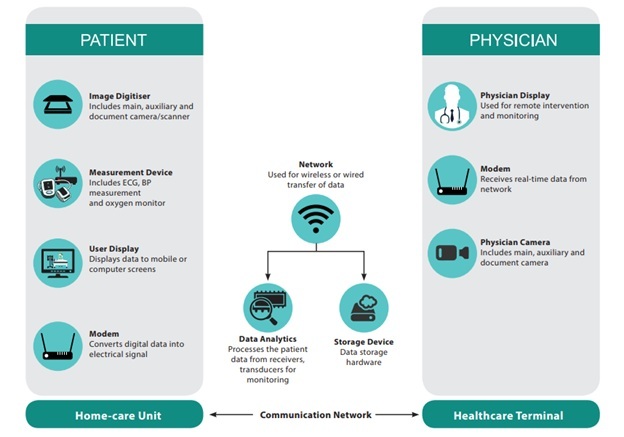 The term IoMT, a healthcare application for IoT technology, consists of a network of interconnected devices that detect sensitive data in real time. The images below outline the impact of IoMT. IoMT increases the interaction between human and machine to improve patient participation in real-time medical monitoring and decision making. 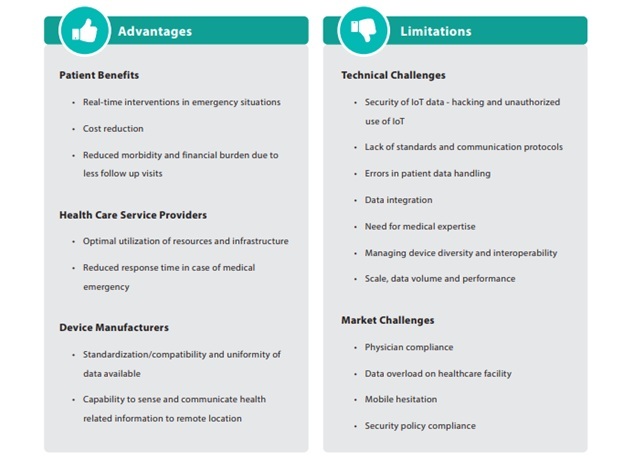 The image below lists the major benefits and limitations of the IoT implementation in the healthcare area. With IoT, you can support data-driven decision-making through health monitoring, data enrollment, and health record maintenance. This can provide a personalized health system for patients. Figure 2 lists the major areas of impact for implementing IoT in the medical field. Enhanced features such as sensors, signal converters, and communication modems allow existing medical equipment to be updated on IoMT devices to detect real-time healthcare data for patient monitoring. IoMT devices are conceptualized in different forms of wearable devices, home medical devices, field-of-practice kits and mobile applications and can communicate with healthcare professionals in remote geographies. Some IoMT applications are discussed as follows. IoMT-enabled gadgets offer groundbreaking alternatives to chronic conditions such as hypertension, heart failure and diabetes. These devices were used to track blood pressure, random blood glucose level, body weight and electrolyte concentration. Real-time critical data provided by these gadgets is processed and used for treatment changes and capacity changes and predicts disease progression. Centralized data collection can also be helpful in studying the dynamics trends of specific populations of specific diseases. The data of the network device is registered in the central office of the doctor. By editing and processing the data, medical automation is possible, analyzing historical data and new data, and determining future courses for patient management. This machine-ready intelligence reduces the cost of enabling service providers to implement routing, monitoring, and site management tasks to the IoMT system to implement subsequent resources and infrastructure utilization. Remote monitoring, telehealth and telemedicine also reduce membership drop-off rates and improve medical resource productivity. IoMT-enabled devices facilitate health supervision with a system that monitors dietary, physical exercise and quality of life. Smart devices, advanced sensors, converters and firmware enable users to evaluate and correlate a variety of critical events with local level status. The remote networking capabilities of these devices also provide expert support for emergencies at all remote locations. The real-time data from the sensor allows the doctor to administer the drug and evaluate the response in case of an emergency. These timely interventions provide high-tech medical care and reduce hospitalization costs. IoMT-based tags can manage drug availability issues and supply costs. The FDA has proposed guidelines for radio-frequency identification (RFID) and medical supply chain management. This includes tagging the packaging of medicines so manufacturers can ensure supply chain quality. These solutions can help pharmaceutical companies overcome risks and losses in their supply chain and management processes. Given the above applications, the greatest potential for using IoT-based gadgets is in the area of chronic disease prevention. The following image shows the estimated cost savings by end application by using IoMT devices. Distributed intelligence is one of the key ingredients of IoT. The most important goal of decentralized intelligence is to create medical devices with intelligent control. This helps to process the data at local level as well as the central server. These gadgets typically have sensors that measure operating parameters, transducers that generate digital inputs, controllers that make informed decisions with inputs gathered from the transducer, and network interfaces that share data with other systems / central servers. Few of such gadgets are wearable monitors, implants and portable diagnostic devices. The compatibility and integration of advanced electronics is an additional element that facilitates the use of the IoT solution at the device level. These devices can capture qualitative, biometric data from the patient’s body and transmit it to a high-level architecture in a secure environment. Encoders, actuators, and encryption devices perform data conversions and deliver them to the second layer of the ecosystem for analysis. This layer is primarily focused on collecting data from network devices and storing it in data stores. The technology in this layer is not unique. Secure medical data transfer technology manages large amounts of data and ensures quality during processing. Networking companies are quite aggressive in providing advanced technology to end-users / system integrators based on their needs. A centralized / remote server gathers data from different devices from the network and key components, regardless of the type of healthcare solution available. Algorithm-embedded servers analyze real-time operational data and provide observation and conclusions. The data centricity helps you diagnose, predict disease and take preventive measures. The Internet of Medical Things market is expected to grow from 37% CAGR by the year 2020 to US$15.6 billion. North America leads markets with high penetration of medical technology and government insurance policies. Future analysts predict technological growth due to increased awareness in the Asia Pacific and European markets. IoT-based healthcare applications are still in the early stages of development, but implementing a connected device can significantly improve medical delivery. Perhaps the biggest advantage is increased operational efficiency due to the increased use of network devices. Transparent data flows from low-level physical gadgets to the cloud enable real-time response at remote locations, which can save lives more than ever. Data-driven decisions empower caregivers to precisely monitor the patient’s overall health status and take preemptive precautions, as well as to respond immediately to emergencies. Interconnected systems are expected to take advantage of smart devices that can reduce patient costs, increase patient compliance, and provide immediate responsive care. Considering this and related challenges, IoMT appears to be a promising technology to improve medical monitoring and treatment outcomes. This technology brings a new era of health and better living standards to the world by providing personalized data-based remedies and optimized devices based on physiological needs. 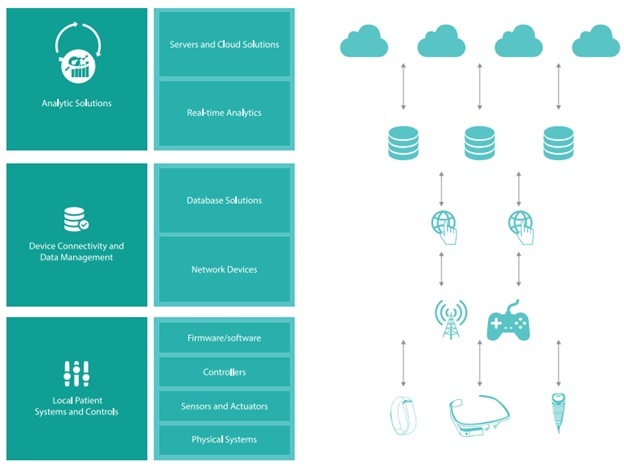 Recent research and development in sensors, networks, cloud computing solutions, storage, enterprise mobility solutions and high-volume data analysis have evolved to enable the development of affordable smart healthcare devices and connected medical ecosystems.